Bitcoin (CURRENCY:BTC) had a decidedly downer of a week. It appears the Securities and Exchange Commission (SEC) is not liking our new digital Wild West. 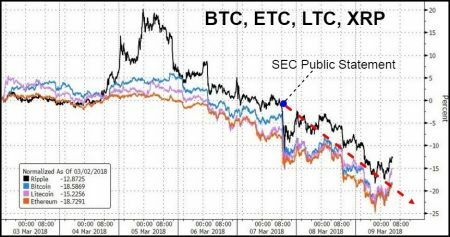 In yet another dig at the industry, the SEC is warning that potentially “unlawful” online platforms are facilitating the digital assets trade. This regulatory scrutiny adds another layer of uncertainty to a market begging to be left alone. The public statement—emanating from the SEC’s Divisions of Enforcement and Trading and Markets division—is a detailed memorandum reminding investors that many ICOs are not suitable for public consumption. Specific emphasis was placed on trading platforms which facilitate trade. In the SEC’s opinion, most of these platforms provide a mechanism for trading assets that meet the definition of a “security” under the federal securities laws. With security comes regulation, and almost nobody in the crypto-industry meets the SEC’s rigorous standards of disclosure. The end result for digital assets investors is not pleasant. Benchmark cryptocurrency Bitcoin has lost over 15% since the announcement two days ago (as of this writing), with the surrounding crypto-complex negative to various degrees. The common theme among investors is unmistakable: regulatory scrutiny is bad for business. To be sure, other negative catalysts have worked in-sync with the SEC memorandum to crush the market right now. Citing flaws in customer protection and anti-money laundering measures, Japan yesterday reached a decision to simultaneously administer punishment notices and trading sanctions against several cryptocurrency exchanges. The scrutiny was originally brought forth by lingering fallout stemming from the 2014 Mt. Gox disaster, where 850,000 customer bitcoins valued at $450 million (at the time) were stolen from the now-defunct crypto exchange. Perhaps catching investors off-guard however, was Japan’s determination to suspend trading on several exchanges. This is a bold stance considering Japan is universally acknowledged as one of the most crypto-friendly places on earth. It was Japan’s decision to accept bitcoin as legal tender that is widely credited for kick-starting the last bitcoin bull market in April 2017. Suddenly, it became possible to do things like pay taxes in non-fiat currency. The decision opened eyes because it elevated bitcoin’s stature to that of state-issued currency within the framework of the law. Russia quickly followed suit, declaring their own plans to legalize bitcoin by mid-2018. Japanese retail bitcoin adoption rates undoubtedly lead the western world. Japan accounts for half of all bitcoin trading volumes, and 260,000 stores in Japan were to accept bitcoin by summer 2017. No other nation comes remotely close in both areas. With Japan going the hawkish route, the sector experienced a double-punch to the solar plexus. Prices have cratered is response, and investors (including ourselves) are struggling to ascertain what comes next. Will bitcoin show yet another round of resilience? Will the accumulation of body blows end in more tears for investors? Every time bitcoin has been counted out, it’s risen to the challenge. Certainly, it’s a tough environment to invest in. All eyes now turn to North American regulators to see if they will further press on the accelerator. Is the SEC Virtue Signaling Further Intervention? From my experience, North American regulators are some of the most measured in the world. Rarely will they machine-gun existing market structures without warning investors in advance. There are very few surprises in our capital markets, and that’s exactly how everyone likes it. Uncertainty is bad for business, and the financial lobby works overtime when regulatory signaling becomes too opaque. If we examine the government’s messaging over the past few years, the signaling is very clear on cryptocurrency. All of it is inhibitory and designed to discourage private sector adoption. For instance, in 2014, the Internal Revenue Service (IRS) issued guidance on crypto taxation and decided it was not actually a currency (de-legitimizing). In July 2017, the SEC declared that the offering and sale of digital tokens “are subject to the requirements of the federal securities law.” In 2017, a U.S. court has ordered Coinbase to turn over identifying information on 14,000 accounts. This paves the way for predatory taxation even though bitcoin’s asset structure is still subject to interpretation. The fact that the SEC has issued yet another threatening public statement is worrisome. They may just be warning investors this time, but what about next time? What happens when the next digital assets fraud inevitably manifests itself? Eventually, one of these memorandums might involve asset forfeiture, exchange suspension (Japan scenario) or outright bans—nobody knows. If it’s happening in places like Japan and South Korea, it can certainly happen here. In a game of chicken against the regulators, I’ll take a pass. While they may not be able to prevent crypto trading outright (especially on emerging peer-to-peer platforms), they control the gateways which make crypto usable. It’s one thing to trade cryptocurrency, but it’s quite another to withdraw it and be able to spend it in the real economy. Until this dark overhang clears, predicting the market is an exceedingly difficult thing to do. Prices will be subject to the whims of an extraordinary volatile news cycle. And right now, that mostly points down. Waiting for further sector visibility doesn’t seem like such a bad idea.